See what's next for the adidas Ultra Boost Uncaged. 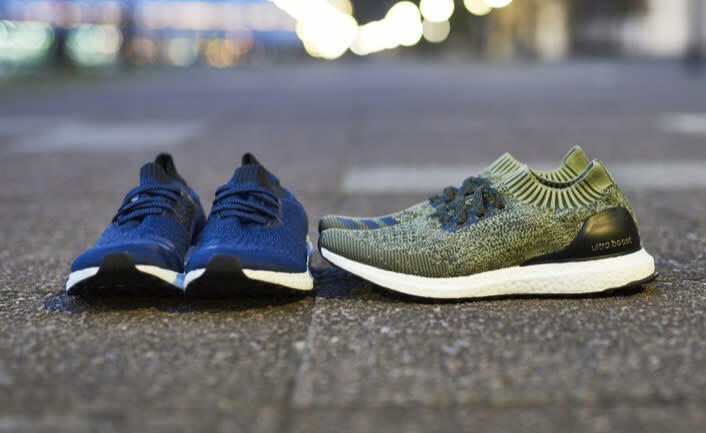 Adidas has another batch of releases for its new Ultra Boost Uncaged planned for Wednesday, July 27. The brand confirmed on Tuesday that the three colorways pictured here will be available tomorrow. For men there are the navy and khaki colorways, while women get the above "Sea Blue" one. The Ultra Boost Uncaged has proven itself to be a success early on, with people going particularly crazy for the colored Boost versions. Adidas backed up the success of the model with its own figures, claiming to have sold 11,000 pairs in one hour. Readers can watch for these styles to hit adidas.com and other retailers on Wednesday.